Successfully fish 5 sparkling fishing spots. Purchase or unlock all relics, equipment, and upgrades. Defeat an enemy by using each relic. Sample each of the Troupple King's ichors. Hit enemies with a reflected projectile 30 times. Solve the woes of the Hall of Champions. Defeat all of the wandering travelers. Defeat 4 of the Order of No Quarter. Finish any Stage without taking damage. Finish the game without spending any money. Finish the game without falling into a bottomless pit. Destroy every possible checkpoint in the game. 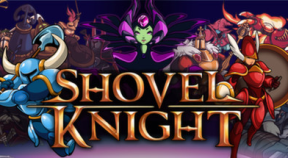 Purchase all available Shovel Blade upgrades. Defeat an enemy with the Flare Wand from more than 25 blocks away. Collect 2000 worth of gold lying on spikes, while using the Phase Locket. Destroy 5 enemies within 5 seconds using the Chaos Spheres. Hang in the air for more than 4 seconds using the Dust Knuckles. Bounce the same Alchemical Coin 5 times in a row. Defeat 3 enemies with one Throwing Anchor. Defeat 3 enemies using the Propeller Dagger without touching the ground. Defeat 5 foes at once using the Booming Horn. Run over 5 enemies using the same Mobile Gear. Finish any stage without dying. Beat the game without collecting any relics. Beat the game within 1 hour and 30 minutes. Have 50000 gold on hand. Destroy all checkpoints in a single stage. Emerge unscathed from a battle with any Knight of the Order of No Quarter. Finish a level and swing the Shovel Blade fewer than 20 times. Finish a level without eating any food. Finish off any boss using the Ground Spark technique. Finish off the Black Knight with a reflected shot. Listen to all of Croaker's puns. Impress Mona with your skills. Don't collect any gold for an entire Order of No Quarter stage. Bounce on the Hoop Kid's hoop for 5 seconds. Discover the secrets of the Troupple King. Use caution and common sense around campfires.